Florencia and her gnocchi at Fratellino’s. A few weeks ago my cousin Florencia took a red-eye to escape Uruguay’s freezing winter giving me a chance to enjoy her company and play tour guide in my hometown. I actually wrote a detailed post about her visit to Miami the minute she left, but as fate would have it I ended up overwriting it somehow. Here goes take two. She landed early in the morning giddy with the excitement of having been upgraded to business class, quite the blessing when facing an eight hour overnighter. An entire post may be necessary to describe the confined hell that is any seat in the coach section of most airlines. The only non-cramp inducing areas are probably the emergency exit seats which come attached to making a promise you never know you’ll be able to keep – if faced with an actual emergency. Are airlines for real? The good news, is you can actually compare airplane seat widths on Travelocity’s seat guru. Back to the perks of being upgraded from Economy to Business. Let’s just say they are good enough to jump up and down like a kid. Fully reclining seats, normal sized pillows, an actual comforter, and last but not least, à la carte meals. Needless to say it was a promising start to her vacation. She landed in Miami looking rested and 100% ready to have fun. Our first stop was at my mom’s who was hosting a welcome barbecue. Before everyone started showing up we hung out at the pool and she got her first glimpse of some of the local fauna, mainly a variety of lizards and bright green iguanas she had never seen before. In the afternoon the family started trickling in and before we knew it it was a full blown party. The following day rained so we designated it a shopping day and took her to the local outlet mall (Sawgrass Mills). I’m known to suffer from a severe phobia of malls but will admit that we actually had a lot of fun. I couldn’t help it, seeing the joy reflected on my cousin’s face every time she scored a killer deal was priceless! Monday she got to explore Hollywood Beach, a lovely beach town between Miami and Fort Lauderdale just a few miles north of Bal Harbour. What makes Hollywood Beach unique is its scenic oceanfront boardwalk punctuated by a number of family-owned restaurants that range from the super casual pizzeria to more elegant french fare. It’s definitely more of a kiddy friendly place and nightlife is relegated to a few Tiki bars. We were only there for a few hours before a gargantuan thunderstorm rolled in out of the blue so headed back to my side of town. We were both in the mood for pizza, but one of my favorite places closed, and Spritz was jam packed for an event. We ended up at Fratellino on Miracle Mile for some classic Italian food. 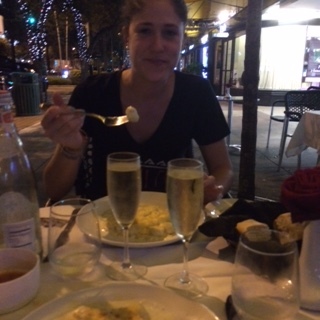 Honestly, I have to say, that night I ate the BEST gnocchi I ever had in my life, hands down. They are not easy to make, so credit where credit is due – Fratellino, you rock! One of the owner’s stopped by our table and told us a little bit about his family history. It ended up being a lovely evening. 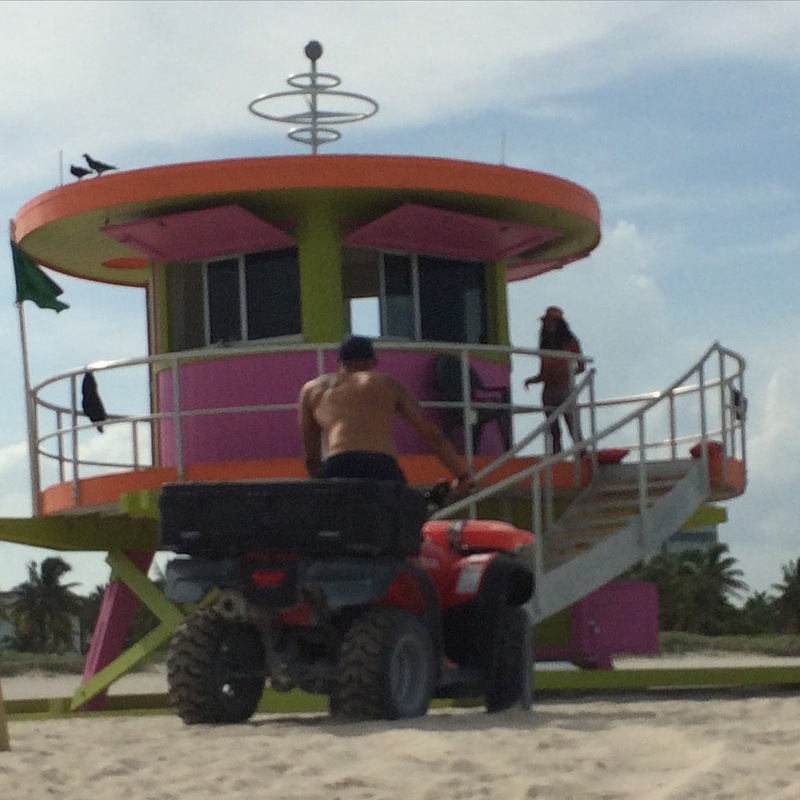 South Beach lifeguards… enough said. The following day we got up early to go to South Beach. First point I want to make is that people love to say you can’t get around in Miami without a car, but that’s just not true. I challenge those who say so to tell me how many times they actually used public transportation. In any case, I proved it to my cousin and took her to the beach exclusively via public transportation. We started by taking the free Coral Gables Trolley service to the Douglas Road Metro Station. Miami Metro Rail runs about every 10 minutes. We took the 1st train going North and got off not even ten minutes later at Government Center Station. From there, we exited the terminal and walked about 1 block to Flagler Street to catch the S route bus to South Beach which took another 30 minutes. The entire commute from doorstep to the ocean was a little over one hour. Not bad considering it would have taken us just as long in traffic. We ended up at the beach right in from of the Ritz Carlton. After a swim it was time for lunch. I decided to take her to a classic South Beach eatery, La Sandwicherie. Practically a local landmark and open until 5AM, its been feeding hungry beach and club goers with smoothies, sandwiches and salads since 1988. Finding food that is simple, fresh, delicious and moderately priced is possible in South Beach. Now you know. After lunch we walked down to Ocean Drive and 10th street to take pictures of the iconic Art Deco buildings frequently associated with Miami. If you live in a city known for tourism you may be able to relate to the fact that people think you live within the frames they’re used to seeing of your town on television. Just as most New Yorkers don’t live on the island of Manhattan on Park Avenue, most of us locals in Miami don’t live on South Beach. 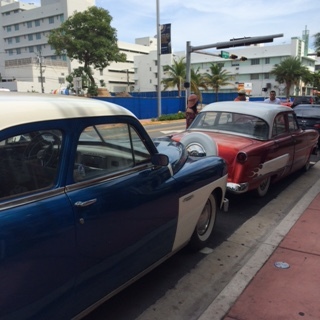 Fortunately for me, my cousin knew the difference between South Beach and Miami Beach. She even knew the names of Miami’s most populous suburbs and where they were located on a map. I couldn’t be prouder! I always recommend traveling with as little expectations as possible but research will definitely help to keep any expectations you do have a little more realistic. Happy travels!